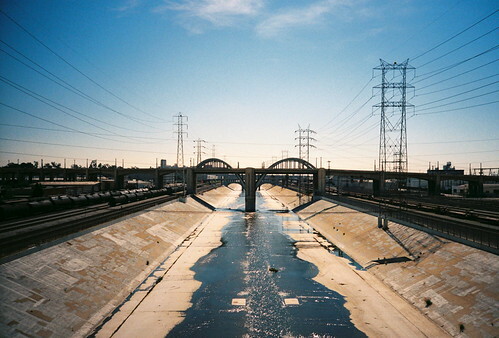 Los Angeles River and 6th Street Viaduct. In late August, Governor Brown signed SB 1201 (de León), which promotes public access to the Los Angeles River. Los Angeles County Flood Control District is now required to provide for public use of the River for recreational and educational purposes, when such uses are not inconsistent with flood control and water conservation. As Sean Hecht mentioned in a previous post, students in the UCLA Frank G. Wells Environmental Law Clinic assisted Friends of the LA River (FoLAR) in researching and developing SB 1201. SB 1201 will fundamentally alter the way the River is governed. In particular, Los Angeles County will probably consider adding new management goals (or changing existing goals) that relate to education or recreation on the River. And we hope to see simpler, “one-stop” river access permitting (as opposed to the 15 permits needed for FoLAR’s Great Los Angeles River CleanUp last year). (c) Planning over the decades has envisioned the Los Angeles River as a vital component of the life of the urban areas surrounding it by providing parkways, open space, bicycle and pedestrian paths, and other recreational opportunities . . . .
(e) . . . the river must be held in trust for the public and managed for public access and use. (f) The public’s interest in use of the Los Angeles River for recreational and educational purposes continues to increase dramatically. However, since the river was channelized, it has been managed for flood control purposes without adequate provision for public access and use. (g) The current regulation and inconsistent enforcement of public access to the Los Angeles River at multiple levels of government are inadequate to ensure the public’s right of access to the river in a safe manner, particularly considering the lack of a comprehensive safety warning system. SB 1201 makes clear that because the Los Angeles River is a navigable water of the state, it is held in public trust for use by the people of California. Increasing the ability of the public to take advantage of the opportunities the River provides is now a goal of the LA County Flood Control District. Hopefully SB 1201 will be the foundation for easier, better and safer public access to the River. Lewis MacAdams, reading a draft of the legislation. Joel Reynolds, of NRDC, is on the left. Photo courtesy Office of Senator Fran Pavley.